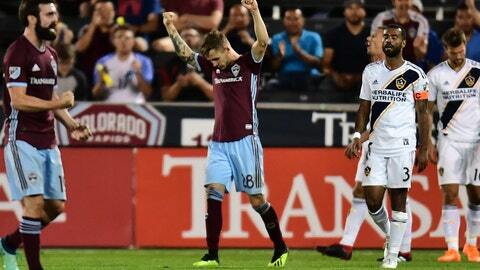 COMMERCE CITY, Colo. (AP) — Sam Nicholson scored in the 90th minute and the Colorado Rapids ended the Los Angeles Galaxy‘s nine-game unbeaten streak with a 2-1 victory Saturday night. Nicholson made a run into the middle of the area and finished Edgar Castillo‘s cutback pass with just enough air under the shot to stay out of the goalkeeper’s reach. Colorado’s defensive miscommunication in the 33rd minute led to Romain Alessandrini putting Tommy Smith‘s botched clearance back into the net for the Galaxy (10-8-5).